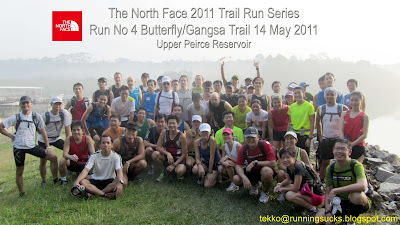 The 4th North Face Trail run in the series. Another big turnout. This time we are exploring what we called the Butterfly Trail. About 60 persons came. We started after a short briefing and ran from the Dairy Farm Carpark B into the Beluakar trail of Bukit Timah Nature Reserve. A short run in the trail and we were on the road into the dark, mysterious but scenic Butterfly Trail. Not too sure who coined the name. Certainly we didn't spot any butterflies during the run although there was one right at the end. This was a twisting turning 3km trail. The trail was a bit narrow and it was single file in most area. There were some man-made obstacles for the mountain bikers but these were nothing compared to the many tree roots and overhanging branches. Running in this environment was extremely challenging. One really has to be alert. A slight mistake and ........ unfortunately that was what happened to one of the runner. He fell and twisted his ankle and had to cut short his run but not before having to limp a lonely 3km back. This marks our 2nd casualties of the series so guys, please be more alert and careful. The Butterfly Trail actually skirts around the upper reach of the Upper Peirce Reservoir and the runners were able to catch glimpse of the beautiful reservoir especially with the mist following the rain of the last few days. Out of the trail, the group gathered for a photo on the dam. Unfortunately, due to the vast difference in the speed of the various runners, some runners right at the back had to miss the group photoshoot. See the mist at the background! The Gangsa trail took the runners along the Bukit Timah Expressway. Most time, we were just running parallel to the expressway. While we can hear the roar of the traffic, we couldn't see any of them. So close and yet so far. Here, the runners encountered all the different type of terrains, from running on lallangs, to clay, to asphalt and dirt! There was upslope, downslope + the usual cyclists to avoid. At the trail head to Mandai Track 15, we stopped for another group photo before making our way back. By then the sun was out and everybody was feeling the heat and the punishing effect of the uneven terrain. One runner became so dehydrated he was not able to run. Fortunately in the end he managed to walk back the last 5 km, and completed the 15km run, probably the toughest one to date. With only 2 more runs to go, the routes are going to be more and more challenging. Running in our hot weather is tough enough. Running in the trail in our hot weather is doubly so. The Run Leaders are there to guide the runners but the runners have to take care of themselves. Participants are therefore reminded that they have to be fit to complete the run. This series of run is not suitable for beginner to running. It is meant for runners who have some experience in running, preferably able to run non-stop for at least 15km on the road and want to try out or enjoy the trails. Participants are also reminded that a 10km run in the trails can easily translate into a 2 hours run and therefore it is essential that they bring sufficient liquids especially as there are likely to be no water point along the route. In the event of emergency, while the Run Leaders are equipped with basic first aid kit, it may not be sufficient and help may come late due to the general inaccessibility of the routes from the main traffic roads. So guys, please read the advisory from the TNF and abide by it before proceeding to register for the next run.